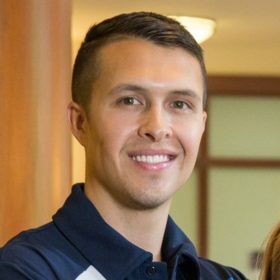 A graduate of the University of Maryland, College Park with a degree in kinesiology, Anthony has been a personal trainer and Fitness Director at Fox Hill since 2009. Anthony and his team of personal trainers design unique exercise programs to help condominium owners achieve their individual fitness goals, from improving overall fitness to recovering from surgery. He also works closely with a physical therapist on-site at Fox Hill to help clients achieve specific functional goals, like climbing stairs confidently or dressing without sitting down. Anthony has been interviewed for WebMD Magazine, Bethesda Magazine and the Washington Post and has appeared on NBC.